America is a relatively young country. This is reflected in its visual iconography. In Europe and Asia, history is found in the religious symbolism embedded not only in the architecture, but within the social and cultural infrastructure. In the USA, the visual language is to be found in the motifs of a dynamic, developing culture, which is rooted in the fabric of the nation and a national identity characterized by a spirit of exploration, desire for adventure and craving for travel. Thus, America’s iconography is to be found in the motel, the gas station and the diner, each emblematic of the pioneering spirit. Where Europe is defined by the restrictive nature of its religious past, America is the embodiment of a yearning to embrace the future. The modern highway is the wagon trail of old, the diner, motel and gas station serving as the hotel, provisions store and staging-post in a contemporary setting. America’s visual language is to be found in the signage, configuration and coloring of these iconic structures. And Chicago- based photographer Patty Carroll demonstrates a profound understanding of the communicative power of the visual image and an awareness of her country’s history in her ironically titled series, “Night Resorts”. 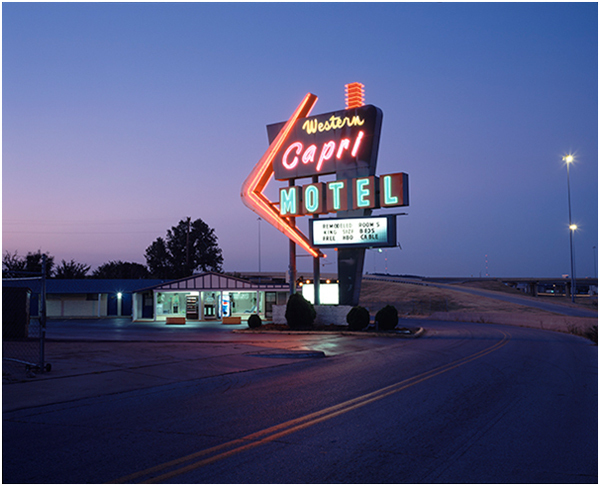 Ironic, because these evocative photographs capture the dubious sense of sanctuary provided by these wayside retreats; their neon- lit frontages represent a place of refuge, an oasis in a world of concrete and steel. But this is a bitter- sweet haven. Beyond the welcoming glow of the lights lurks dark, threatening shadows which represent the highwayman, the mugger and our fear of the unknown. The absence of people imbues Carroll’s locations with a feeling of transience, of a place lacking permanence or any connection with an outside world. If it were not for the life blood of the highway these would become ghost towns; these settlements exist solely to service the consumer who must fulfill the basic human needs of eating, sleeping and filling the car with petrol. The diner, gas station and motel in Carroll’s photographs are as much symbols of American consumerism and commercialism as anything deemed to be within the genre of Pop Art; their design employs many of the same visual devices as those used by Warhol, Lichtenstein and Tom Wesselmann. Indeed, Carroll carries on the uniquely American tradition of the image maker as observer, commentator, reporter and archivist with the same attention to detail and sense of gravitas as demonstrated by such photographic luminaries as Adams, Shore and Eggleston. And this is of major significance if we are to appreciate the true depth of Carroll’s work. Eggleston particularly did much to raise the status of photography to that of a discipline which is now considered on a par with others within the field of Fine Art. Carroll obviously shares this philosophy and makes reference to other media, other genres within her photography. Carroll not only knows her art history but makes reference to it with confidence. For example, in her series, “Diners”, Carroll captures the essence of isolation; the loneliness of the traveler, of a life on the road; tables are set for one, the atmosphere is sterile and impersonal; there is no home comfort in evidence here. The emphasis is on momentary efficiency; fill up and move on. The subjects are women; young, fashionable women dressed in 1960’s couture, obviously mobile and independent but equally, alone. Carroll’s photographs are packed with symbols; low slanted light through shaded windows, a suitcase held close, meals designed to provide comfort remain uneaten. The colors are muted, matched and subdued, the composition reminiscent of a contemporary movie still, abandoned coffee cups and cigarette packs, set- dressing in a desperate film noir with a cast of one. But in Carroll’s photographs, we are presented with the fantasy of the diner, a cinematic representation of an idealized American road trip where the women resemble Rita Hayworth or Audrey Hepburn, strangers are mysterious and the world is as wholesome as the food. Yet within this Brave New World there are references to the old. Carroll’s women do not make eye contact with their audience; they are portrayed as vulnerable but remote and unapproachable. This was a device which characterized early 19th century European paintings, where theo viewer was invited to look but not to touch, and remained the norm until Manet’s “Olympia” had the audacity to stare directly – and threateningly – back at the spectator. 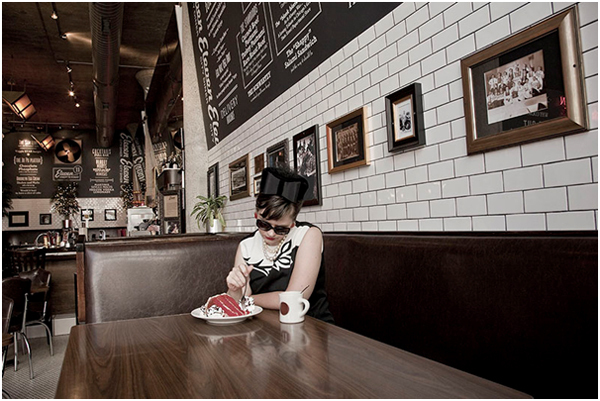 What Carroll captures so successfully in “Diners” is the enigma of the beautiful stranger, each character being a symbol of the transitory nature of the diner customer, each representing a story to be discovered, a brief moment shared in a communal space. In Carroll’s photography we celebrate the all -too -short history of America’s visual heritage; it is a brief legacy but one that is well documented, widely distributed and almost universally understood. This is the triumph of American art. 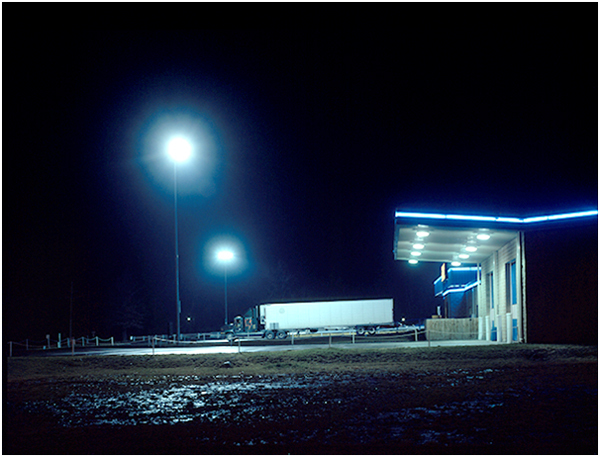 But what Patty Carroll captures so well in her work is a version of the America Dream as envisaged by Jack Kerouac, Steven Shore and Edward Hopper; there is beauty in her imagery but it is contextualized within an austere, sometimes bleak urban landscape. Who do you consider as the major influences within your work? Edward Hopper, definitely. I can get lost in his lonely, separate world of color and space. Walker Evans is very important to me. His sense of the visual, the current, the beauty in the ordinary add up to an incredible aesthetic. I studied graphic design before photography, so I relate to his vision that also strongly emphasized the visual impact of reality. I was lucky to have studied a photography course with Garry Winogrand and Art Sinsabaugh. Both guys were tough, great photographers that insisted that you be very careful about what is in the frame. Lastly, there was a group of painters in Chicago called the “Hairy Who.” Some of them are still around. They all had a wonderful sense of humor with a biting, cutting edge to their narratives. Each one also is very strong visually especially with color. I can relate to the sense of heightened color and craziness. How much of a role does your knowledge of cultural history play in your work? Quite a bit, I have read and read. Earlier I did a book on Elvis Impersonators, which enabled me to read more about American culture seen from other points of view. Last year, another project that I have worked on for years came out as a book, called “Man Bites Dog: Hot Dog Culture in America”. Bruce Kraig, the author and I worked together for years putting this together. I think it is an example of cultural information paired with photographs – both explain the other! However, my work has always been about loneliness mostly from personal experience. I think that all artwork is from a time or moment in one’s life that has great emotional or psychological significance. Returning or reflecting on that time is often what artists express in their work. Think of Mike Kelley, whose work always seemed to me to be about some early memory of being a toddler! Nan Goldin admitted to me that her work is all about when her sister committed suicide. Do you take inspiration from other media? For example, would you agree that there is a cinematic quality to your photography? 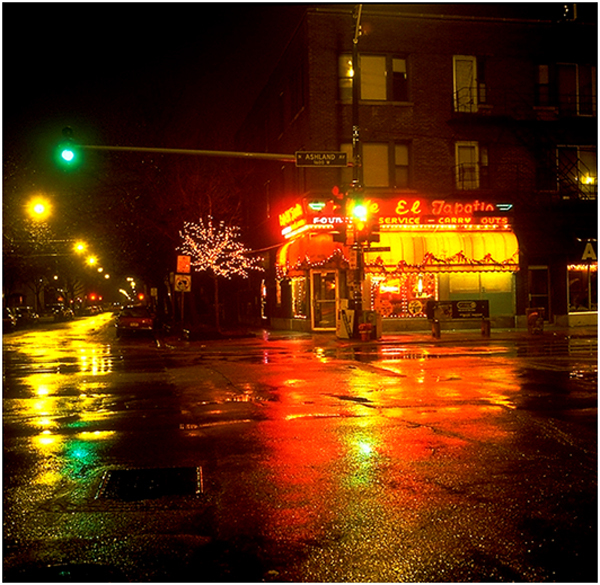 Yes, the night pictures I have always thought of as locations for stories or movies that the viewer might make up. In 2003/04, I did a humorous series of Faux Movie Posters, based on film noir posters from the 40’s and 50’s using the night pictures as a basis for the “films.” Totally silly, but to the point. I am a film noir addict, and can watch old ones in marathon viewings. I also love David Lynch, the Coen Brothers, and other film directors who have a dark edge to them. So yes, the inspiration comes from other media, particularly film. Do you regard yourself as a documentary photographer or a social commentator? I think if you are a good documentary photographer, you are really also a social commentator. The places, events and things that we notice as photographers must have resonance not only with ourselves, but the culture at large. (Being visually astute helps quite a bit too!) Although I have made many pictures that document reality, usually the ones I choose to show are ones that have more to them, something that is important to me, and my inner vision of the world. From a technical point of view, can you give us a rundown of the equipment you use most frequently? It has changed! I used to use my trusty Hasselblad 500C, which I still use in the studio. I used it for many years before digital. I also really love the Mamiya 6 and 7 for film. When I was making the night pictures, it was only the camera on a tripod with a long exposure. If I needed more light, I would rely on car headlights or possibly a fill flash somewhere during the long exposure. But now, I am using a Canon 5D. If I could afford it, I would buy a digital Hasselblad! The work that you are featuring is a small kit: tripod, 5D, and possibly my canon flash on the camera with a Gary Fong light modulator. How much time do you spend on post-production enhancement? It depends on the project. The night pictures are only gotten ready for print: taking out dust, making sure the contrast and saturation are correct, and sharpened for printing. The Diner Ladies are desaturated, and I might take out something that is a distraction to the image. I try not to do too much to the image, but am interested in the overall effect. Also, I am really fast at this stuff, as I am and Adobe Certified Instructor in Photoshop, and teach various techniques all the time. Do you have a project in mind that you are desperate to tackle? Yes, I have a couple of projects in mind. One is a studio project based on the home, with still-life images. It may or may not happen, but I am accumulating images for it. On my documentary side, I am interested in how there are televisions in public places everywhere you go, restaurants, malls, even at the gas pump and in cabs. The way our lives (especially in the USA) are mediated through advertising and sound bites and snippets of news is really weird. It is an isolating factor, and changing our culture for the worse. I cannot tackle the hand-held devices, as it is too ubiquitous. 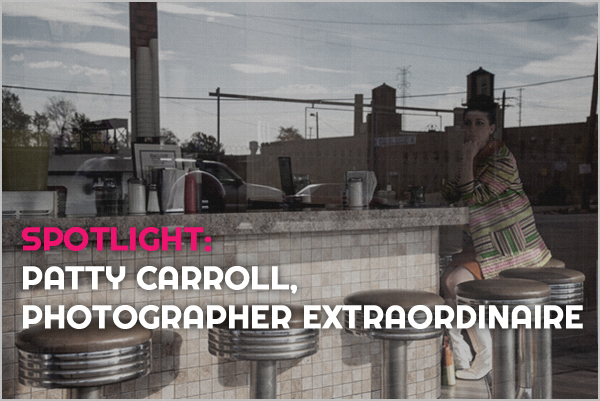 Please use the links below to access more of Patty Carroll’s work on her website. You should also visit her YouTube channel where you can view a fascinating interview but some short videos of the “drapery ladies” are misbehaving. The interview of Patty Caroll was conducted by Michael Stewart of Interactive Design Institute.